Black plants on a world with two suns. Jack O'Malley-James of the University of St Andrews has studied what plants might be like on an Earth-like planet with two or three suns and found that they may appear black or grey. He will be presenting results at the RAS National Astronomy Meeting in Llandudno on Tuesday 19th April. Photosynthesis - converting sunlight into energy - is the basis for the majority of life on Earth. It is the energy source for plants and, hence, animals higher up the food chain. With multiple light sources, life may have adapted to use all suns, or different forms may develop that choose to use one specific sun. This may be the more likely option for planets on which parts of the surface are illuminated by only one sun for long periods of time. "If a planet were found in a system with two or more stars, there would potentially be multiple sources of energy available to drive photosynthesis. The temperature of a star determines its colour and, hence, the colour of light used for photosynthesis. Depending on the colours of their star-light, plants would evolve very differently," said O'Malley-James. In M star radiation habitats, vegetation may have more photosynthetic pigments in order to make use of a fuller range of wavelengths, giving them a ‘black’ appearance. 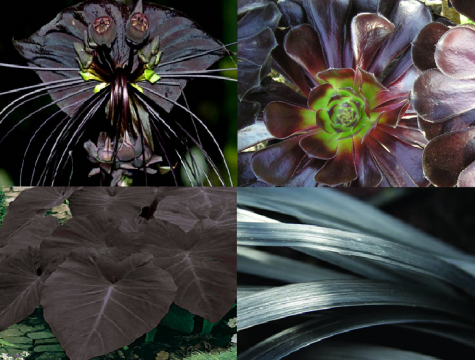 Above: Terrestrial examples of a dark plants (and flowers). O'Malley James is working on a PhD, supervised by Dr Jane Greaves at the University of St Andrews, Prof John Raven of the University of Dundee and Prof Charles Cockell of The Open University, to assess the potential for photosynthetic life in multi-star systems with different combinations of Sun-like stars and red dwarfs. Sun-like stars are known to host exoplanets and red dwarfs are the most common type of star in our Galaxy, often found in multi-star systems, and old and stable enough for life to have evolved. Over 25% of Sun-like stars and 50% of red dwarfs are found in multi-star systems. In the teams simulations, the Earth-like planets either orbit two stars close together or orbit one of two widely separated stars. The team has also looked at combinations of these scenarios, with two close stars and one more distant star. "Our simulations suggest that planets in multi-star systems may host exotic forms of the more familiar plants we see on Earth. Plants with dim red dwarf suns for example, may appear black to our eyes, absorbing across the entire visible wavelength range in order to use as much of the available light as possible. They may also be able to use infrared or ultraviolet radiation to drive photosynthesis. 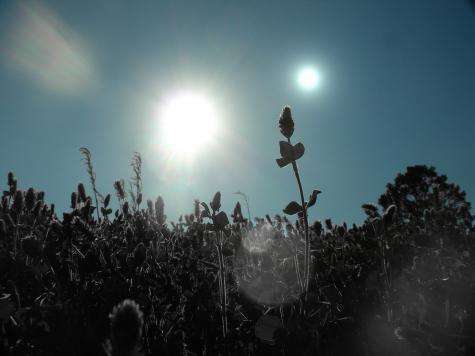 For planets orbiting two stars like our own, harmful radiation from intense stellar flares could lead to plants that develop their own UV-blocking sun-screens, or photosynthesising microorganisms that can move in response to a sudden flare," said O'Malley-James. I would think life evolving in such a system would be wildly different from ours and nothing resembling a different-colored but familiar plant (which would also require water and carbon dioxide). I would expect the increase of light and radiation as well as heat, particularly in the artist's rendering of a blue sun(!) would promote synthesis of energy in a variety of new and unexpected ways, even considering Earth's extremophiles. I have to wonder at cell and DNA stability under constant bombardment of radiation/heat; it would have to be a hardier form than what we know of carbon-based life. I would like to point out that plant life on earth doesn't generally use all the spectrum available..generally they're like people, they try to use one or two parts of the spectrum very well (absorbtion points of their particular pigments, most commonly chlorophyll), instead of trying to use all parts of the spectrum, and doing it terribly. It is certainly possible for some plants in some cases to try to use all the spectrum (And doubtless occurs somewhere), but from a direct comparison here, on a planet with less energy and more impetus to fully use the spectrum, it seems logically unlikely that planets with more abundant spectrum would see plants using more...they use only parts of it here as is - and we only get significant radiation in 2 or 3 small slivers of spectrum. In a rainforest, the plants at the canopy, with the most available spectrum, produce the fewest energy harvesting pigments. While the plants at the bottom of the rainforest, with the least available energy produce the widest variety of energy harvesting pigments. It is certainly possible for some plants in some cases to try to use all the spectrum . Bioenergetics- with more than one sun AND a broader spectrum of EMR, our planet and the dead animals and plants we burn as fuel would provide a higher energy matrix for advancing life forms and technology. Fuels we have to synthesize like, acetylene, could be formed under sheets of ice at our poles or deep within our oceans. Further, ORDINARY photosynthesis, could occur year round, in shaded pools and near-polar areas. A higher average energy quotient would be involved in all chemical species: Space travel/flight, the first 1000 years of civil life! I have to wonder at cell and DNA stability under constant bombardment of radiation/heat; it would have to be a hardier form than what we know of carbon-based life. I guess we'll have to go there to find out. Not in my lifetime though. Your extra wax comment gave me an idea for how extra energy could be harvested on a light poor exoplanet. The plant's leaves could secrete a clear waxy liquid in the form of tiny droplets which would have the effect of refracting and thus concentrating the available light. The bubbles would also increase the surface area for light collection. One way around that is what some hardy microbes already do on Earth. They're very resistant to radiation not by maintaining stability, but by having an ultra efficient repair mechanism. As soon as DNA is damaged, it's repaired before it can become a serious problem. Does the Better Business Bureau cover websites? Because somebody needs to WRECK etrading.com for screwing around. two suns in the sunset ... could be the human race is run.. Anything one can imagine exists. So...there are articles on this same research on MSN, io9, etc...and they all correctly say that the research says the opposite of what it says on physorg...that you would most likely see grey or black plants on planets orbiting red dwarf stars, and that plants on planets orbiting multi-star systems are more likely to be selective and have a more interesting palette of colors. Physorg science writer fail. hmmmmm....y not....??? it's probably gonna be hostile in our perspective.....but..survival of the fittest indeed..! !